The accepted opinion of piano industry professionals is that from a musical point of view, it is better to buy a good quality upright piano (ideally around 130cm tall) than a grand piano smaller than 5ft in length. Phone your piano tuner and see what s/he says about that. 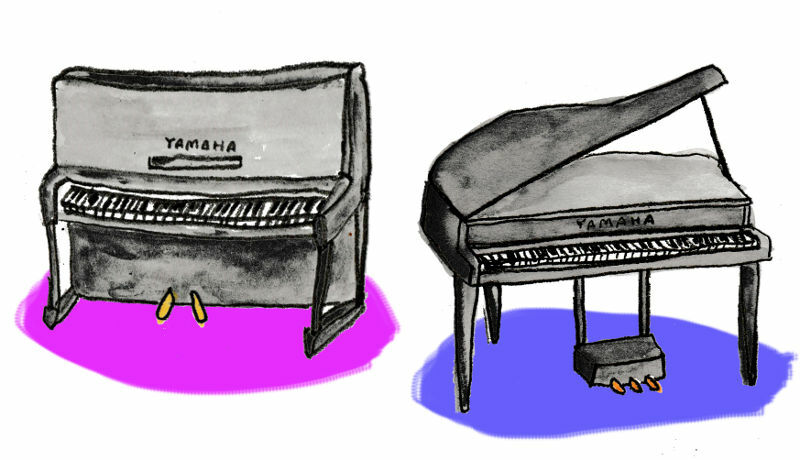 A Yamaha U3 has longer bass strings than a baby grand piano less than 5ft in length. To get the best from a grand piano you should really be looking at a minimum length of around 5ft 7in (Yamaha C2 or G2) or above. Anything below that can have shorter strings than a large upright. That said, the Yamaha C1 or G1 grands are 5ft 3in and produce a nice tone but you will need to be aware that the bass will not sound as rich as the C2 or G2. So if possible, try to go for a C2 or G2 instead of a C1 or G1. As a side note let me say that the C1 and C2 are the replacement models for the G1 and G2. They are both Japanese made and aimed at professional pianists. When people spend about £4000 – £6000 on a 4ft – 5ft baby grand piano they are usually making a furniture decision. They like the “idea” of the baby grand piano and they are often willing to overlook the fact that the musical quality may be compromised due to the size. Piano manufacturers are aware of this and so there is a massive price war on at the moment for who can produce the lowest priced baby grand piano. They know that customers will not be spending hours assessing the touch or tone and so the pianos may be made to lower musical standards. The end result is a lesser quality piano housed inside a nice looking cabinet. It looks fabulous but may not have a sound quality to match. Of course the manufacturer blurb of these cheap baby grand pianos still says things like “made with German parts” and “designed in collaboration with a German piano designer” but learn to take all of that with a pinch of salt and ask (a) where was it made? and (b) is it longer than 5ft 3in (Yamaha C1 G1 size) or 5ft 7in (Yamaha C2 G2 size). Don’t go smaller than a C1 G1 and try to aim for a C2 or G2 or above. Sorry if I’m repeating myself a little bit here. Some piano manufacturers do offer high quality baby grand pianos but they are much more expensive, up above £12,000 and so this puts them out of reach of most baby grand piano buyers. In general a new baby grand at £5000-£7000 will be made in China or Indonesia and be of a questionable quality whereas a new baby grand priced above £10,000 will probably be a very high quality and will be made in Japan, USA or Germany. As mentioned above, bigger grand pianos are better than smaller grand pianos. The same is true of upright pianos. I always recommend that you should try and get a piano that is above 130cm high. If that is too much for your home then you should certainly stay above 120cm. The Yamaha U3 (131cm) and Yamaha U1 (121cm) are 2 very popular pianos that fit this recommendation. Piano manufacturers are producing lots of cheaply made small upright pianos at the moment and people are snapping them up. They look great, they have impressive names on the fallboard but if you take the time to sit and play them you will see that the quality just doesn’t compare well with the the taller pianos that are designed to be good pianos rather than just attractive pieces of furniture. Larger upright pianos are aimed at the massive number of pianists all over the world who have gone through their early grades and they now need a piano that will see them through their grade 8 and as far beyond that as their ambition will take them. Once you buy a high quality upright you will never need to upgrade again unless you move on to a 6ft or longer grand piano. For this reason, piano manufacturers put an enormous amount of effort into making sure that these bigger upright pianos are built to the highest standards possible. They are not aimed at the people who buy pianos as pieces of furniture. These pianos are aimed at ambitious students, piano teachers, university students, music school practise rooms, small concert halls. They are built to last for generations whilst providing a top quality sound the whole time. The clear winner over the past 40 years must surely be the Yamaha U3. The magic formula for piano manufacture is to combine high build quality with a sensible price. Reasonable quality with low price isn’t good enough. Good quality with high price is not good enough. Without high quality manufacture, you will never achieve the massive popularity of the Yamaha U3. And that’s why it has done so well, it has an unchallenged combination of quality and price. What about Yamaha’s smaller uprights? You have the smaller Yamaha B1 at the cheaper end of the scale which I believe are made in Indonesia (correct me if I’m wrong). You have the P series in the middle (small to medium size, higher price, good quality, made in various factories around the world but not made in Japan), and the U series at the top with high prices and top quality. Not many people can justify spending £8000+ on a new U3 but thankfully, they are built so well that if you buy a professionally reconditioned U3 you will enjoy all of the benefits of a new one for about half the price. That is why it remains the most recommended piano in the UK. Ask your piano teacher or tuner if they recommend a properly reconditioned U3 and most will say yes. If you have the money to buy a high quality baby grand piano that has been made in Japan or Germany then you should consider that as a serious option. New ones will cost you over £14,000. Used ones will be around £10,000. However, try to see if you can push to at least a C1 or G1 (5ft 3in) or ideally a C2 or G2 (5ft 7in). If you are mainly looking for a nice piece of furniture then go for the latest cheaply built Chinese or Indonesian made baby grand piano for around £5000. It won’t sound very nice, it won’t hold its value, but it will look very very nice. If you have less than £5000 to spend and you are looking for a top quality instrument then I would say that a baby grand piano is not the right choice for you. I would suggest spending between £3000 – £5000 on the highest quality, properly reconditioned Yamaha U3 that you can find. They have a full, rich tone and a professional quality action. They are suitable for grade 1 and also for beyond grade 8.